“Our founders put the first amendment first for a reason. It protects all Americans’ right to free speech, regardless of political affiliation or views.” This statement was made by former Sen. Norm Coleman (R-MN) in 2007, but it expresses a commonly cited view among lawyers, judges, politicians and pundits. In fact, what we today know as the first amendment wasn’t originally intended to be the first amendment. 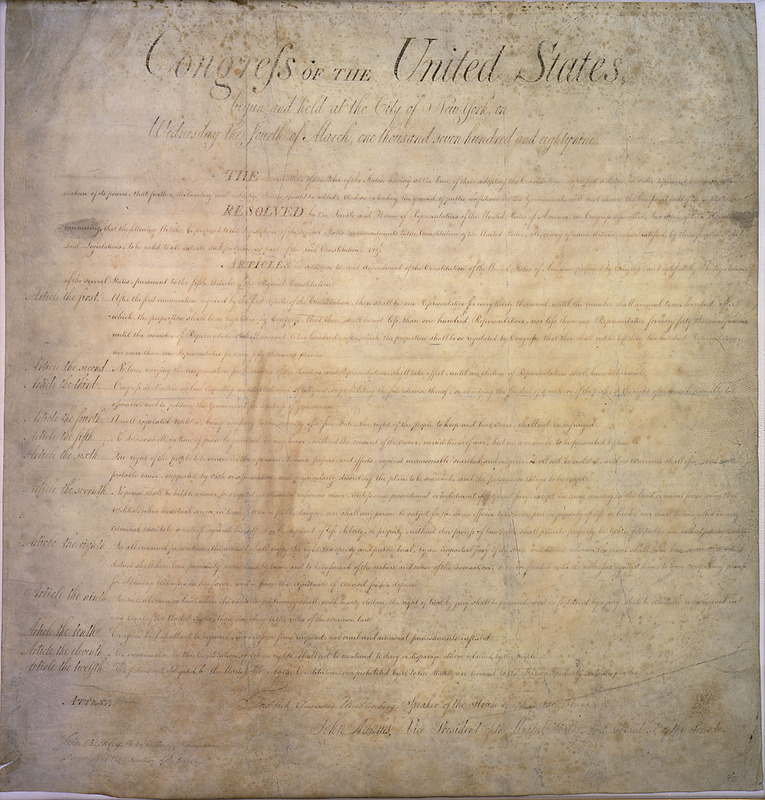 Examine closely this copy of the original Bill of Rights, as submitted to the states. Today’s first amendment was originally the third article. The original second article, which prevented Congress from giving itself a raise without an intervening election, was ratified in 1992 as the 27th Amendment. In simple English, this amendment, properly interpreted (most agree that there’s a scrivener’s error in the final line), would have fixed the maximum size of a congressional district at 50,000 people. It should technically be part of the Constitution: It was ratified by the requisite number of states in June 1792, but for whatever reason, Connecticut’s vote to ratify the article was not recorded and was only later rediscovered. Indeed, there has been (unsuccessful) litigation to force the Archivist of the United States to do so. With that said, it is probably just as well that it has never been recorded. We would be forced to choose between two bad options. First, we could allow the size of Congress to grow to over 6,100 members. When Congress was in session it would qualify as a top-20 city in eight states; California would have more than 700 representatives. The other option would have been to amend expressly our original Bill of Rights, a precedent we’ve thus far avoided. Nevertheless, this article really was placed first for a reason. The debates over the ratification of the Constitution, as collected in the Federalist Papers and less-well-organized Anti-Federalist Papers, contain a surprising amount of discussion over the size of congressional districts (the Federalists argued that large districts were beneficial to avoid elections from turning into personality contests), and there was an implied promise contained in the ratification of the Constitution to pass an amendment regulating district size. Even though Article the First was thought to have gone unratified, the early Congresses seemingly tried to follow the animating principle behind the Amendment. It kept the size of districts roughly stable until the 1820 reapportionment, and district size didn’t increase beyond 100,000 constituents until the 1860s. When Congress last increased the size of Congress in 1912 (setting aside temporary expansions for the admission of states), each representative had just over 200,000 constituents. Today a representative answers to over 700,000 constituents, well over 10 times the number of constituents deemed appropriate by the First Congress. While it seems unwise to adhere to the strict letter of Article the First, the time has likely come to abide by its spirit and increase the size the House. The United States is supposed to be the world’s premier representative democracy, yet India’s Lok Sabha is the only lower chamber on the globe where representatives have more constituents. Indeed, Pakistan’s National Assembly and Indonesia’s People’s Representative Council are the only other lower chambers with a population-per-seat ratio exceeding even 400,000. First, a bigger House would diminish the impact of malapportionment that comes with single-member states. A certain amount of malapportionment is inherent in House redistricting, but as the number of single-member states grows, this effect becomes more and more pronounced. The largest single-member state, Montana, requires a representative to take on over 1 million constituents. On the other hand, the smallest state, Wyoming, only has 582,000 constituents. This will become more pressing in 2020, when Rhode Island is expected to lose one of its two House seats. Unless Montana gains one back, there will be more single-member states than at any time in our country’s history. Roughly one in six states will be single member; the only time that ratio was higher was immediately following the 1820 apportionment, and then only because three single-member states had been admitted to the Union shortly before the reapportionment. As a side note, and as a result of the next apportionment after the 2020 census, New Jersey will likely have its smallest congressional delegation since the first decade of the 1900s, New York since the first decade of the 1800s, Ohio since the 1820s and Pennsylvania since the 1790s. As a result of the last apportionment, Illinois has its smallest delegation since the 1860s, Indiana since the 1830s, Iowa and Missouri since the 1850s and Massachusetts since the original apportionment. This is all despite massive increases in population size. Second, increasing the size of the House could diminish the impact of gerrymandering. While the commonly voiced concerns about the evils of gerrymandering are overstated, they aren’t entirely without basis. Moreover, the perception of impropriety is important, and there’s something inherently untoward surrounding legislators drawing districts that resemble Rorschach inkblots rather than compact units that draw together communities of interest. Larger legislatures make it more difficult to gerrymander effectively. Think of it this way: If there are 100 residents in a state with 100 congressional districts, there is no gerrymandering possible. If there are 50 congressional districts, it isn’t impossible, but it is still difficult. If, however, there are only five districts, a legislator will probably be able to draw the lines to cluster a disproportionate number of Republicans in a single district, leaving Democrats overrepresented in the remaining districts. In fact, we see this to some extent in state legislatures. Let’s assume, somewhat controversially, that the partisan composition of state legislatures ought to roughly correlate with presidential performance in the state. We can look at all 98 state chambers that have partisan representation, and look at the difference between the Republican vote share and Republican presidential performance in the state to get a sense of how gerrymandered the state legislatures are (we’ll take the absolute value, since we don’t care if Republicans are over- or under-represented). We can then perform a regression analysis, using the size of the legislative chamber as our independent variable. The coefficient points the right direction (as chamber size increases the disparity between presidential performance and the partisan orientation of the chamber decreases). The result isn’t statistically significant at 95% confidence, but from a policy standpoint, we’re still awfully confident that the relationship is “real.” (p=.229). If we add a further control for whether the lines were drawn by a commission or partisan legislators, the relationship becomes stronger (p=.17). I suspect that with a proper control for partisan concentration in a given state, the relationship would reach full significance. Third, increasing the size of the House would make majority-minority districts easier to maintain. As I noted in my last piece for the Crystal Ball, as states shed districts it becomes increasingly difficult to draw compact groupings with populations that are made up predominately of members of minority groups. A number of Northern states are likely to find themselves forced to draw fewer majority-minority districts in the upcoming round of redistricting. At the same time, many Southern states have congressional delegations that underrepresent the minority share of the population. Mississippi is 37% African American, but only one of its four-seat delegation is majority black. Louisiana is 32% African American, but only one of six is majority black. Alabama is 27% African American, but only one of seven is majority black. Florida is 16% African American, but if Democrats are successful in pressing a redistricting lawsuit against the state, it may be the case that only one of its 27 members is African American. With more districts, however, relatively small, discrete populations can suddenly support their own preferred members. For example, if you doubled the size of the House, drawing three African-American majority districts in Alabama is a piece of cake, and drawing a fourth district — rendering 29% of the state’s seats majority black — is not difficult. Drawing nine African-American majority districts in Florida is a bridge too far, but four of 54 — easily done — is closer to true proportionality than one of 27. Fourth, increasing the size of the House would improve rural representation. It’s striking to go through early Almanacs of American Politics and observe how many districts were based in small towns or even entirely rural areas. But as America has become more urban and as district size has increased, that has gradually eroded. In 1970, five of Virginia’s 10 districts contained little-to-no territory from the major population centers of Richmond, Hampton Roads and Northern Virginia. Today, that’s unambiguously true of only two districts. Now-extinct districts like Louisiana’s Eighth (no major population center) and Alabama’s old Third (Dothan, Phenix City) have been necessarily eliminated. Even the few remaining rural/small town districts are endangered; each decade, Nebraska’s Third District marches inexorably eastward toward the outskirts of Lincoln and Omaha. Rural and small-town districts will inevitably comprise smaller and smaller fractions of Congress as long as our nation grows and urbanizes. At the same time, they shouldn’t be allowed to go extinct, as rural and small-town America have unique needs and problems. Increasing the size of the House would help address this. Fifth, though this is difficult to measure and hence more speculative, increasing the size of the House could help mend some of the detachment that is felt between Washington and the states. Campaigns would be less expensive, so politicians would have to spend less time fundraising, and representatives would have fewer constituents to answer to, allowing for more personalized representation. It may even be that smaller constituencies allow for the election of more ideologically diverse members. Indeed, there is some correlation between the size of state legislative chambers and the number of third-party/independent candidates elected. What would the downsides be? Perhaps it would be more difficult to get anything accomplished, although that rings false given the glacial pace with which the current Congress operates. It would be more expensive, although congressional staffs could be smaller, offsetting some of the cost. It would still be only a small fraction of the federal budget. At bottom, there’s nothing magic about the number 435. While we probably wouldn’t want 6,000 representatives, there are still 27 legislative bodies that are larger than the House of Representatives. The British House of Commons operates effectively with 646 members (each representing about 98,000 constituents). Adopting that size would translate to one representative per 485,000 constituents, bringing us back roughly to where Congress was in the 1960s. Even adopting the so-called “Wyoming Rule,” which would set the size of a Congressional district at the population of the smallest state, would result in a House of only 547 members, tying for the 13th largest in the world. This would still decrease the number of constituents per district by 20%, and would help minimize the distortions from malapportionment. A variant of this would guarantee that every state receives at least two representatives; this would increase the House to around 1,100 members, about 40% larger than the British House of Lords (and still half the size of the Chinese National People’s Congress). Of course, this is unlikely to happen. For one thing, none of the interest groups in Washington would want it, as it would make their jobs harder and diminish their clout. More importantly, increasing the size of the House of Representatives diminishes the power of each individual member. It isn’t in their interests to pass further increases in House size. But regardless of whether such a proposal is likely to pass, it seems an unabashedly good idea that citizens and legislators should nevertheless press for.